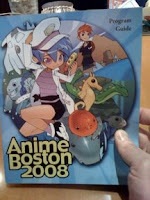 Gordon's STEM Blog: Anime - Do You Get It? Up eary this morning with my 16 year old daughter for a 1.5 hour drive into the Hynes Convention Center in Boston for Anime Boston 2008. How many of you out there have parents who just don't get it? Brothers? Sisters? Friends? Significant others? Well, this weekend you will all be surrounded by people who get it.... You and all the other attendees will be part of this big family who gets it! Standing in line with thousands of teenage gamers is probably the last thing someone my age would want to do on a Saturday morning. That said, I don't think I've ever been around such a large group of respectful, complementary and helpful people - of any age. For example, I have not heard one of George Carlin's "7 words you are not allowed to broadcast" today yet! If I were to compare the adult crowd at a Red Sox game late last summer to the people that are here today..... well..... there is no comparison.